Kitchen remodeling is one of Bob's specialties! Perhaps you just want your kitchen cabinets refinished? Or would you really rather have your entire existing kitchen gutted and completely remodeled from the ground up? Either way (and for everything in between), Bob and his team have the expertise and experience to bring your vision to reality. Depending on your budget, chances are that we have a spot for you—everything from a minor kitchen remodel (for example, stripping and refinishing your existing kitchen cabinets), to major kitchen remodeling projects (and anything in between) as outlined in the "Cost vs. Value" section on this page. 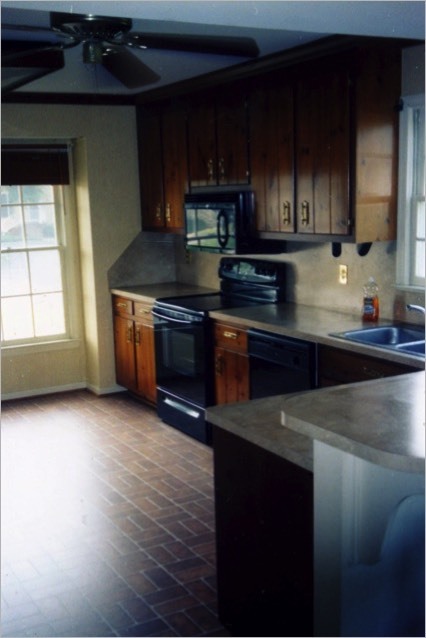 Looking to have your entire kitchen remodeled? Bob and his team have you covered. Deciding to have your entire kitchen remodeled is a big decision, and it can feel overwhelming, given the wide variety of tasks involved (and knowing that part of your home will be a construction site for a while!). Working in close consultation with you, Bob and his team can turn the entire process into a turnkey operation—the deep knowledge and experience that Bob and his team bring to their flooring, cabinet and painting work will be focused on a single goal: realizing your vision for your new kitchen, with as little fuss as possible! Did you know that homeowners typically recoup a substantial percentage of the cost of a kitchen remodel when they sell their homes? That's an important fact to consider when deciding on a kitchen remodel—and it makes sense, given that the kitchen is often cited as one of the biggest things that sells any given home (ask any real estate professional). On this page, we've included information on the cost vs. value for kitchen remodeling (see item 1 in the "Answers to Some Frequently-Asked Kitchen Remodeling Questions" section below), with cost figures provided for minor and major remodeling projects, in both mid and upscale ranges. As you examine those figures, keep in mind that this is one area where a remodeler's experience makes a particularly big difference—in Bob's case, his 30 (and counting) years of experience often means that you'll get many of the features typically associated with an "upscale" remodel, but at a cost that is closer to a "midrange" price point! That's one of Bob's strongest skills—knowing exactly how to use your hard-earned money to get you an upscale look and features at a good mid-range price! We specialize in cabinet touch-ups, refinishing, replacement doors and solid-surface countertops, as well as the reliable laminates. When the cabinet finish is worn to the point that it can no longer be touched-up, the best alternative is to strip and refinish. All doors and frames are refinished to the color of your choice: wood stains, bleached or painted. When you wish to change the appearance of the kitchen without the expense of replacing the entire cabinet, replacing the doors and drawer fronts is your answer. There is a wide variety of styles and species of wood to match your framework. In most cases, older cabinets are of higher-quality than that of the store-bought cabinets of today! 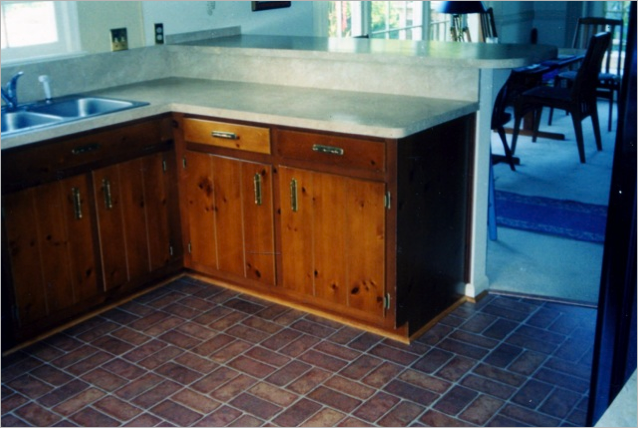 We can build all-wood cabinets to match your existing cabinetry at a reasonable cost. Rollout drawers and garbage can rollouts are also available. We can remove your old countertops and install new laminate, solid-surface, Corian®, Quartz®, Silestone®, or even granite countertops (as well as many others), with your choice of colors and a variety of edge profiles to choose from. And of course, all the work will be performed by certified fabricators and installers. For an informative overview of the different countertop material options available, check out section 6 below ("The Pros and Cons of Different Countertops"), which contains information provided by interior designer Tammy Franklin, and is reproduced here with permission. Vinyl, tile, laminate, as well as hardwood. Check out our Custom Flooring page for more details. Didn't see a particular service you were interested in? Call us at (757)851-9618, and ask! Be sure to check out examples of our work (including several "before and after" photos) in the photo gallery. Should I rip out my old kitchen cabinets and start from scratch, or refinish and restore the existing ones? Will the expense involved be worth it--how much will a remodeled kitchen add to the overall value of the home? What materials and procedures are best for the job? How much time should I expect the work to take, and what is the sequence of events during a typical remodeling job? How much should I budget to remodel my kitchen? Click on each numbered section below for answers. Want more information? Call Bob (757-851-9618) with your questions, or to set up a personal presentation; he will be happy to supply you with an informational booklet containing the data provided here. Ask any real estate professional and they will tell you that "the kitchen is the big thing that sells the home." It is not unusual for someone to call us and say that they are going to sell their home in two or three years and would like to remodel the kitchen now, so that they can enjoy the new kitchen in the meantime, then sell it for more when they do sell. 1. What are the national averages for the amounts spent on minor and major kitchen remodeling projects? 2. What percentage of those expenses did the homeowners recoup when they sold their homes? Description and Scope of Project: In a functional but dated 200-square-foot kitchen with 30 linear feet of cabinetry and countertops, leave cabinet boxes in place but replace fronts with new raised-panel wood doors and drawers, including new hardware. Replace wall oven and cooktop with new energy-efficient models. Replace laminate countertops; install mid-priced sink and faucet. Repaint trim, add wall covering, and remove and replace resilient flooring. Description and Scope of Project: Update an outmoded 200-square-foot kitchen with a functional layout of 30 linear feet of semi-custom wood cabinets, including a 3-by-5-foot island; laminate countertops; and standard double-tub stainless-steel sink with standard single-lever faucet. Include energy-efficient wall oven, cooktop, ventilation system, built-in microwave, dishwasher, garbage disposal, and custom lighting. Add new resilient flooring. Finish with painted walls, trim, and ceiling. Description and Scope of Project: Update outmoded 200-square-foot kitchen with 30 linear feet of top-of-the-line custom cherry cabinets with built-in sliding shelves and other interior accessories. Include stone countertops with imported ceramic or glass tile backsplash; built-in refrigerator, cooktop, and 36-inch commercial grade range and vent hood; built-in warming drawer, trash compactor, and built-in combination microwave and convection oven. Install high-end undermount sink with designer faucets, and built-in water filtration system. Add new general and task lighting including low-voltage under-cabinet lights. Install cork flooring, cherry trim. So how much of these expenses were the homeowners able to recoup when they sold their homes? In other words, homeowners were able to increase the selling price of their homes by at least 84.8% of the cost of their kitchen remodeling projects (in the case of the Minor Kitchen Remodel, they were able to add 98.5%--almost the entire cost--of the amount spent on their kitchen remodel!). In short, if there's one remodeling project that will affect your home's resale value, it's a kitchen remodeling project! Data provided by Remodeling Magazine Copyright (c) 2008 Hanley Wood, LLC. Reproduced by permission. Complete regional and city data from the annual Remodeling Cost vs. Value Report can be downloaded for free at www.costvsvalue.com. Mistake #1 : Picking a contractor based only on price! 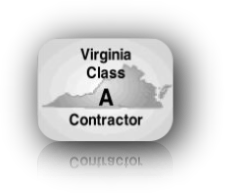 Mistake #2 : Thinking that all contractors are the same. Mistake #3 : Always having 3 or more contractors competing with each other for your work. Mistake #4 : Thinking that having the right equipment is all a contractor needs to do your job. Mistake #5 : Not giving your contractor enough time to complete your job properly. Mistake #6 : Selecting contractors who don't guarantee their work. Mistake #7 : Not bothering to ask for references. Mistake #8 : Not asking for explanations if you don't understand the "lingo." It is impossible for any company in any industry to offer the lowest price, while having the highest quality and providing the best service all at the same time. You can get high quality and first-rate service, but you can't get both and still get the lowest price. Just as in your own business, the best long-term results are obtained when you hire the best people and buy the highest-quality products--consequently, you will have to charge more for your services than others who do not have a long-term, maximum-value view. "Researchers also found that more than three out of 10 remodelers said they would spend more money on a kitchen remodel if they had to do it over, while only 7% said they would spend less. Of those who would spend more, the key things they would do differently next time are upgrading the cabinets and increasing the size of the kitchen." Now cabinets are a big chunk of your outlay when putting together all the things you have to buy when remodeling a kitchen. They can easily amount to a quarter or half of the total budget. 1. The cabinets are not as sturdy as they assumed, and are not holding up. 2. The shelves are not thick enough and are bending under the weight of their dinnerware. 3. The drawers are very shallow and items catch in them all the time. 4. They keep chipping plates trying to get around center dividers in two door cabinets. 5. The shelves in their cabinets are fixed and not adjustable, or the adjustments are drilled too far apart to give real adjustability. 6. The shelves in their base cabinets are 2/3 depth instead of full depth. 7. Their drawers are made of skimpy materials, like particleboard, and are breaking. 8. Their cabinets are unfinished on the insides and require shelf paper and drawer liners. 9. Their cabinet hardware items (hinges, drawer slides, etc.) are flimsy and not holding up. 10. The finish on their cabinets is lacquer, and is not holding up. The fact is, these people assumed that the beautiful cabinets they saw in the showroom were all the same because they could not SEE any difference between the set that cost $8,000 and the set that cost $24,000. And now they have LEARNED the difference by living with their choices. Now, I am not saying that you have to spend three times what you would like to spend to get a quality cabinet. But what I am saying is that you have to look at what you are buying with a critical eye. And you MUST do the research to know what features you absolutely must have in cabinets. Then, you must spend whatever is needed to get a quality cabinet...Otherwise you will regret spending less, as those consumers in the study did. Most people get only one shot at a kitchen remodel in their lifetimes, so these mistakes go on and on. Don't regret. Do it right. So there you have it. We couldn't have said it better ourselves. Note : In an effort to help you choose the right contractor, we've compiled several contractor-selection criteria in the form of a questionnaire, and placed them in a downloadable, printable document. You can download the file (it's a PDF file), then print it out and use it when evaluating potential contractors. To view the contents of the file, simply click here; to download the file, simply right-click on the link, and choose "Save As..."
Oil Finish: means using a clear finish produced by rubbing an oil, such as linseed or tung oil, on bare or stained wood. The oil is rubbed to a soft, glowing finish. This is also called a Danish oil. Polishing: means using a very hard-drying, short oil varnish used for interior woodwork, furniture, etc., and capable of being rubbed with abrasive and mineral oil lubricants to a very smooth surface for a desired degree of gloss. Clean, Prime and Re-coat: means using solvents that do not soften the finish to clean its surface; light sanding, and applying a primer coat (Kilz) before applying finish coats. Clean and Re-coat: means using solvents that do not soften the finish to clean its surface; light sanding, color glazing, spot coloring and topcoating with an appropriate finish. Stripping: means using chemical paint and varnish removers, scrapers, steel wool, scrub brushes and/or rough sandpaper to soften and remove all finish down to the bare wood. Preparation: means rough-sanding, patching, bleaching, fine scraping and fine sanding to make the woodwork ready for finishing. Finishing: means to apply stains, glazes, sealers and topcoats to the wood surface. Perform sanding between coats of finish and use pigmented and dye stains for coloring. Finish can be varnish, shellac, oil, lacquer or waterborne coatings, and may be applied by rags, brush or spray. The labor and material differences in these procedures vary so much, unfortunately many consumers are making choices based solely on short term cost as opposed to long term values. You must be extra cautious when choosing this investment because there really is a right way and a wrong way in the refinishing field. We have had to fix several kitchens because of dishonest or unlearned salespeople. You really do get what you pay for when refinishing. Experience is a must for a lasting job. Bob has over 35 years in this field and has a proven track record as a professional finisher--read what some of his customers have to say, if you haven't already! 4. Too Many Material Choices!!! It's important to be familiar with the types of finishes available, because the best cabinet job in the world can be ruined by a sloppy finish. The first major decision is to decide if you are happy with your cabinet's current look, or if another look entirely is in order. This will determine how much work will be involved in getting your cabinets from where they are to where you want them to be. There are three main types of wood cabinet finishes: the "Stain and Clear" finish, the "Undercoat and Paint" finish, and the "Glaze" finish. Note that unfinished natural wood cabinets are a thing of the past--in today’s land of cabinetry, a transparent topcoat is added to your unfinished cabinets to protect the wood from dirt and grease and maintain its beautiful look. Stain and Clear Finish: Staining your your cabinets is a great way to add color to the wood without ruining the beauty of the wood grain. You want to be careful when picking stain colors because manufacturers use all different names. The same name might be a completely different color under another company. Your best bet is to select the wood you prefer and then consider the final look you want. At that point it will be easier for you to decide whether a stain with a light, medium, or dark tone will be best for you. A stain alone will not protect your wood, however. A good penetrating stain will soak into the wood and allow for a better bond. Some cheaper woods may not allow this as the beauty is just not there and you have to use a topical stain. You must first apply a finishing coat over the stain to protect it. In most cases, a good quality spray lacquer sanding sealer followed by a finish lacquer will give you a nice, furniture-quality finish. If the cabinet is in a high-moisture area such as a spa, you may even need to change to a marine varnish. This type of finish is one of the longer-lasting low-maintenance finishes. Undercoat and Paint Finish: The wonderful thing about paint is that you have such an enormous range of colors to select from. When you are looking for a smooth, glossy finish, paint can do the job! First, you want to pick the correct primer. This is the most essential undercoat layer of paint. For a long-lasting finish, the primer must be absorbed into the raw wood, as it is “the glue that holds the paint to the wood." The oil undercoaters tend to be far superior to their latex counterparts as far as absorption and sandability for a slicker professional finish. The best finish to apply at this point will be the harder Alkyd Oil Finishes. This is another of the longer-lasting finishes. Glaze Finish: With a glaze you have the option of using it by itself or applying it over a base stain or paint. Once it is applied, it is then wiped off by hand. As you wipe off the glaze, it settles in the cabinet's open grain areas and defines its details. Glazes can also be tinted any color. Contrasting the color of the wood with the color of the glaze creates a uniquely attractive look. This finish can look nice but does not have the longer life expectancy. It's worth reiterating that without proper preparation of the wood, even the best finishing job will fail. The Hardwood, Plywood & Veneer Association has noted that 95% of the problems with refinished cabinets are caused by inadequate wood preparation prior to finishing. The remaining five percent are caused by inexperienced painter–finishers, poor finishing conditions, or unsuitable finishing procedures or products. Let’s break down the finishing system by percentages: preparation should take 30% of the time spent on the project, stain application and sealing should take 30%, and topcoating and sanding between coats should take 30%. That leaves 10% of the project time for protection prior to and after finishing. These are standard percentages used in the wood finishing industry. However, custom projects with special finishes or painting may require a different approach. It is the painter–finisher’s responsibility to understand the characteristics of the wood he or she is about to finish and properly prepare the wood prior to finishing. Be warned: if proper preparation procedures are not followed, the final look and performance of the finished woodwork will not be of a premium level and might be rejected. This is yet another area where the experience and skill of a trained, veteran finisher will really show. So what exactly is a "stain" for, and what about the other finishes--paints, lacquers, varnishes, etc.? Stain: Staining your cabinets is a great way to add color to the wood without ruining the beauty of the wood grain. You want to be careful when picking stain colors because manufacturers use all different names. The same name might be a completely different color under another company. Your best bet it to select the wood you prefer and then consider the final look you want. At that point it will be easier for you to decide whether a stain with a light, medium, or dark tone will be best for you. A stain alone will not protect your wood. You must apply a finishing coat over the stain to protect it. Lacquer: Lacquer is the workhorse of all finishes and has been around the longest. It has its limitations, but used correctly it will give you a lifetime of service. It is very user–friendly and easy to touchup. Some lacquers are now being made with low VOCs (Volatile Organic Compounds). Conversion Varnish: Conversion Varnishes are more durable to abrasion, chemicals, and moisture, but most brands come with a short pot life and are sometimes touchy to catalyze. I have been told that the pot life is going to increase, and some are being manufactured in low VOC formulations. Waterbased: Waterbased finishes have advanced over the years and are becoming more popular. They are user–friendly with no or low VOCs, but good heat and air ventilation is needed for spraying and drying performance. The Architectural Woodwork Institute (AWI) still does not rate waterbased finishes as a premium grade finish, and I would recommend only using them for topcoats and not for sealers. UV Polyurethanes: UV finishes use radiation to crosslink and cure the finish and are improving and gaining popularity in the finishing industry. They are ultra–durable, dry in seconds, and some have no VOCs or formaldehyde. However, UV finishing systems are very technical and carry a costly capital investment. I feel all the above finishes have a place in today’s finishing marketplace and I recommend that you investigate which finish will suit your needs and situation best before specifying one. Feel free to consult me if you have any questions on which finish is best for your particular situation. Lacquer Cabinets: Lacquer cabinets became available in the 1920's after WWI (they had to use all the left-over cotton from gun powder somewhere). Lacquer is an excellent finish, especially the moisture resistant type. It is also the most widely used furniture finish. Lacquer itself has a long history in the far east, dating back over 2,000 years in China. The Chinese are experts at applying several thin layers to achieve the look they want. Lacquer cabinets are a good choice. Each manufacturer of lacquer makes lacquer with varying degrees of elasticity, color, and resistance to water, solvents, acids and alkalis. Ask your supplier which lacquer is right for you. We always had good luck with any Sherwin-Williams lacquers, and found them to be the best in our custom cabinet shop, whether it was in application or durability. • Lacquer is a complex finish, meaning it is made of several components. Often it is made partly of cotton or wood, but most of it is a resin. • Lacquer is a film finish. That means it does not penetrate the wood, but rides on the surface. • With each additional coat of lacquer, the lacquer that's already on the piece re-melts and all the lacquer becomes one. This is unlike shellac, varnish, and polyurethane, were each coat is a separate layer and the layers do not melt into each other. • Lacquer is easily applied with spray equipment, you can brush it, but it is difficult because it dries so fast. • Because lacquer dries fast, it eliminates dust problems. • Under normal circumstances, lacquer dries to the touch within 20 minutes, and can be scuffed and re-coated within two hours. • Lacquer can be applied in all types of weather (you may need to add retarders, thinners, etc., but it can be done). • Lacquer is resistant to water, and more resistant to heat and solvents than shellac. • You can lacquer cabinets with a clear lacquer, white, black, cream or several other colors. There are 2 types of lacquer, nitrocellulose and cellulose. Nitrocellulose is the one you will find. Cellulose was used occasionally because it is much less amber in color and yellows less over time, however, it is more expensive then nitrocellulose. With the introduction of water-base finishes that do not yellow at all, the use of cellulose lacquer diminished. We used cellulose once in our custom cabinet shop, and found it to be a little "plastic" like, and if the wood was scratched the least bit, the finish seemed to peel off there. The only advantage cellulose has over water-based finishes is that it doesn't raise the grain of your wood. Raising wood grain can be a real challenge for a finisher using water-based finishes. Keep in mind that, as with any type of finishing, the proper application of Lacquer to produce the desired result requires more than just patience and persistence (although it certainly requires both of those!). In addition to the right solvent to be mixed with the Lacquer, one needs to take into account the atmospheric conditions (humidity level), and the thickness of each coat of Lacquer applied. What's more, Lacquer is dangerous to use, and the solvents needed are highly-flammable, toxic, and air-polluting. As such, the spraying process should take place in a well-ventilated area, and even then, only with ventilator masks. An experienced finisher will be very accustomed to taking all the necessary precautions, and will have all the necessary equipment. • Use a mild soap (Dawn dishwashing liquid, Ivory, Murphy's Oil Soap, etc.) and water. • Don't let water sit on the wood. • You can clean with a good furniture polish (this is a good idea if you wash a lot, because washing with too much water will, over time, hurt your finish if done in excess). • You can use a lemon oil on the wood (it cleans and brightens), but not until your finish is at least six months old. Lacquer does not fully cure for six months. • If you use lemon oil or a furniture polish, know that because you are putting oil on your finish, it may cause problems in the future if you actually need to refinish your cabinets. The oil may cause fish-eye (a pooling and cratering of your finish due to the oil under it). Lacquer cabinets are beautiful and the finish will last a long time. The advantages of alkyd paint far outweigh the downsides. The rich, smooth, porcelain-like finish cannot be matched by acrylic paint. When properly applied it has no equal. Oil Finish/Polishing: This is one application we rarely need to do for the customer as it really doesn’t take any special skills to apply this (just a lot of elbow grease). Clean, Prime and Recoat: This application was invented by the paint companies to try and get rid of oil base products.You may remember many cars in the last 30 years that the paint peeled off in sheets due to this same principle.Your cabinets were originally finished with a hard finish such as lacquers,varnishes,enamels etc. Primers such as Kilz, Bins, etc. are made of a softer material which needs to be absorbed into unfinished wood. Once applied over a hard finish, since it cannot be absorbed, it creates a sandwiched layer of a hard finish /a soft primer/& a hard finish which will create a great potential for your cabinet finish to chip off. We simply refuse to follow this method even though it is considerably a cheaper way for a short-term finish. It will usually last a couple of years before it needs to be completely redone or at some point new cabinets installed--we've seen too many examples of this, even in high-end homes. Clean and Recoat Method: This procedure we have found to be your best method short of completely stripping and refinishing your cabinets. To do this your cabinets need to be in good shape except for minor chips or minor bad marks in your wood. If your wood has lost its luster this procedure might work for you without a complete strip. First the cabinets need a complete and thorough chemical cleaning, a scuff sanding as well as an extensive cover-up for spraying if possible. We then apply an etching coat (grabbing coat) to the old finish. This is still a hard coat (as opposed to the soft primer coats used in the "Clean, Prime and Recoat method" described above). The finish coats are then applied as needed--either a clear coat or colored finish. This will now give us a Hard finish/Hard etching finish/Hard finish. Since all coats are hard-finished we find this to be a good fix in some cases. Strip and Refinish Method: This is the only real tried and true method to bring your cabinets back. First of all your cabinet quality needs to be worthwhile as far as this investment is concerned. Many of the older cabinets were custom built and were certainly not made to be throwaways. It is very important to remember that if your older cabinets are still in generally good working order, you will surely be better off having them refinished properly than you will by buying a newer but mediocre piece of hardware (such as the ones made with particleboard or Medium Density Fibreboard materials). It would be a terrible shame (and waste!) to see custom cabinets that were structurally built for a lifetime of use become a lost thought of the wiser generations, while mediocrity is becoming all too familiar with the new. Most of the cabinets of today will not have the life expectancy as the custom cabinets of yesterday. The more cheaply made non-fitting cabinet boxes & doors made of particle boards and MDF materials last even less than 10-20 years and unfortunately continue to fill the landfills. Replacement of new replacement & refaced cabinets will be a must as even the new finishes will wear out considerably quicker because of lesser material applications (fewer coats of finish). Luckily for some of us the hardware (hinges/pulls) and cabinet finishes of old usually gave us between 15-30 years before they lost their original beauty. The real wooden doors and boxes were actually built for many lifetimes of use if the finish (cabinet protection) is kept intact. This procedure is certainly the only true method of a real professional refinish. We start this operation with a chemical degreasing wash, and follow up with a major rough and medium sanding of face frames, cabinet boxes, as well as doors and drawer fronts. Next we follow with an extensive sweep-up as well as a complete cover-up of work area. Two coats Clear sealer or Minwax Stain with two coats of clear sealer (or two coats of enamel undercoat) is then applied. A fine finish sanding and then either two coats of finish paint or three coats of clear topcoat. Spray finishing when possible. (Absorbed primer coat(Glue coat)/Hard Finishes). There are lots of options on the market for kitchen countertops. Our list of top picks gives the pros and cons of the top 10 choices so that you can make an educated choice when you remodel your kitchen. CONS: very expensive, requires lots of maintenance, including periodic sealing; absorbs stains; can crack; limited range of colors available. Engineered stone is composed of quartz particles. It is available in a larger range of colors than granite and has a nonporous surface that resists scratches. It's easy to maintain, without the annual sealing required by natural stone. Brands on the market are DuPont Zodiaq(R), Cambria Quartz, and Silestone. Because of it's extremely high price tag, marble is not often seen on the countertops of whole kitchens. To get the luxurious look, use it on an island or as an inset at a baking center. Marble requires constant maintenance, as it easily stains. Some new sealers retard staining. 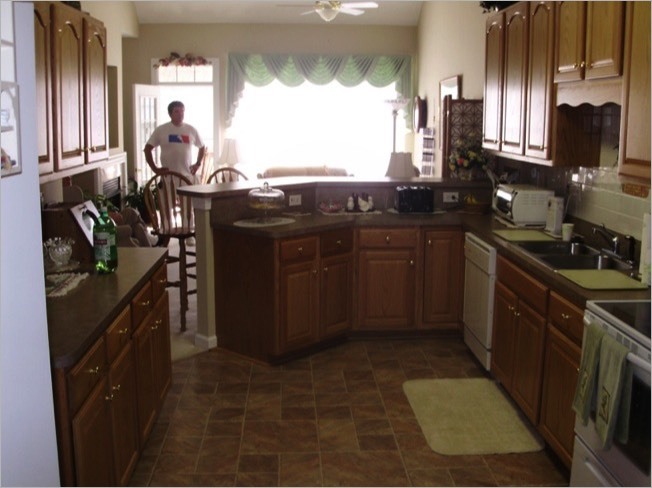 What can you expect from having Bob and his crew perform your kitchen remodeling project? First and foremost, the peace of mind that comes from knowing that Bob holds a Class A License, is bonded and insured, and has 35 years of experience in the field. That level of experience brings with it a set of "best practices" that he uses to ensure that the job gets done right, on budget and on schedule, while minimizing the fuss and inconvenience that can be associated with a major home renovation project. Oh yeah, and he absolutely loves what he does. To keep as much of the mess out of your home as possible the first thing we do is to pull all your doors and drawers and take them back to the shop/unless we are replacing them. If we are changing countertops /floorings/doors/or trim we will take measurements at this same time, so we can order these as well as hardware or any miscellaneous items that may be needed to keep the work in your home to a minimum. At this point it will be 1-3 weeks before we return to start work in your kitchen .This allows us time to get doors finished as well as materials brought in for a timely completion in your kitchen and you time to clean out your cabinets. The time in the house is usually less than 1 week on smaller kitchens and 2-3 on larger kitchens. We will start by moving and protecting furniture and accessories, either to another room or to the center of the room being worked. Next we will cover doorways to try and contain the dust and smell as much as possible followed by a thorough chemical cleaning of the cabinet boxes and a major stripsanding if necessary. A complete sweep-up will follow making us now ready to begin our finish processes as described above (sprayed when possible). We mask all areas next to the woodwork being refinished; we use 4 mil poly, rosin paper, and masking paper to protect floors, 1 mil poly to protect walls. We secure these materials using, "no lift" blue tape. While the great expanse of floor and wall will not be affected, sometimes the area immediately next to the woodwork will and create tape pops. We cannot be responsible for this as we must cover-up these areas. It may require minor repainting of these areas, or minor recoating of flooring. Occasionally we find old repairs done to fill in gaps and seams in the wood. These will generally NOT be removed, but be colored in to match the surrounding finish. We fill obvious nail holes, gaps and gouges with wood putty or caulk, but won't attempt to fill every blemish or depression in the wood. Because of the nature of old wood, there may be variations in color or distinct discolorations, that staining will not improve and we cannot always eliminate them. We now remove all masking materials and perform touch-ups. Cabinet doors & new hardware are now installed as well as your new countertops /floors and painting if required. Throughout the process, we'll keep you informed of what's going on, so that there are no surprises or "hidden costs." In fact, once you decide to have Bob and his crew perform your remodeling project, he'll start out by filling out a Project Proposal and Contract form which spells out the scope, timeline and cost of the job. You can view and/or download a copy of this form (it's a PDF file), then print it out and use it when you meet with Bob. To view the contents of the form, simply click here; to download the form, simply right-click on the link, and choose "Save As..."
Consider the fair market value of your home to determine your kitchen budget. The kitchen represents 10-20% of the fair market value of a home. Investing less than 10% of the fair market value may result in a kitchen that doesn’t meet expectations; exceeding 20% makes it more difficult to recoup expenses upon a sale. Of the kitchen budget, 50-65% of the cost should be designated for cabinetry and countertops (or 50% cabinetry and 15% countertops). Another 15% can be expected for appliances, flooring and other goods like lighting, plumbing fixtures, etc. The remaining 20-35% includes the costs of labor, design elements, contracting services, etc.--since many contractors figure their costs on a "per finished square foot" basis, this amount would include the square footage of your kitchen times the cost per square foot. If it is a onetime "today-only" deal, it is called a high pressure sale and that sales person probably needs his commission as he most likely will not be doing the actual work in your kitchen. If it sounds too good to be true, it is. When you pay too much, you lose a little money - that is all. When you pay too little, you sometimes lose everything, because the thing you bought was incapable of doing the thing it was bought to do. This is as true today as it was over 100 years ago. 9. What Should You Do? 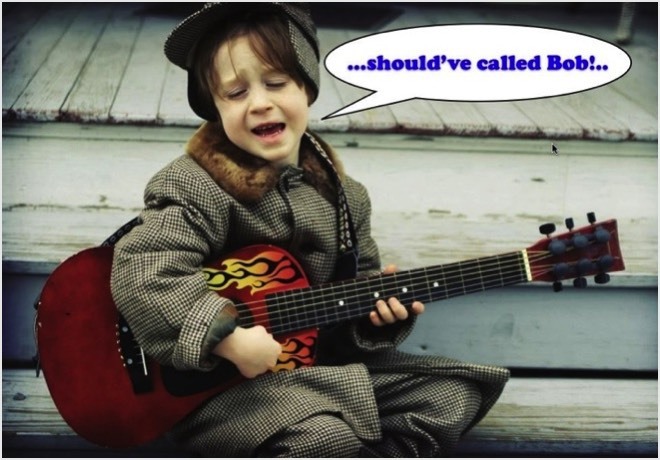 Call Bob at (757)851-9618 so you won't be singing the kitchen remodeling blues!